Every Spring, the blues descends upon Bay St. Louis, a quiet town along the Mississippi coast. Only an hour east of New Orleans and west from Alabama, Bay St. Louis prides itself on being the “Most of the Coast”. Longing to be the best of small town life and old- fashioned fun, it’s full of local bars, cafes, and bookstores, like Jeremy Burke’s Bay Books on Main Street. 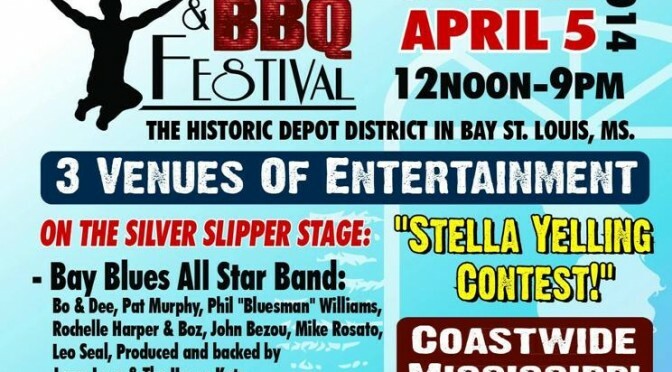 Stella’s Blues & BBQ Festival will hosts many loal bands, and, with a Coastwide Mississippi BBQ Menu, you’re sure to come hungry and leave happy. Presented by Silver Slipper Casino & The Bay St Louis Little Theatre. The Festival is held at the Historic Depot District in Bay St Louis, MS. Call 228-467-0855 for more information.